If you’re looking for unique holiday gifts, consider the Ms. Mint Holiday Bazaar. 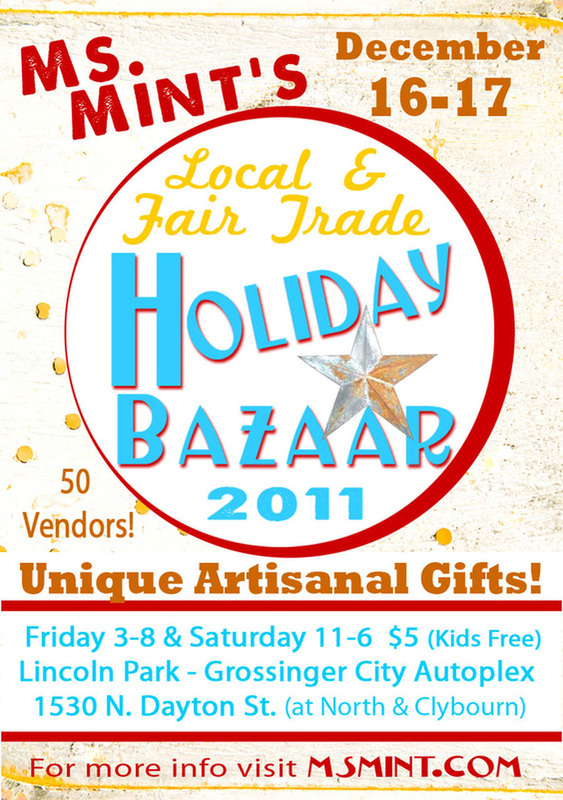 Over fifty local food producers and craft vendors will have their wares for sale on Friday, December 16 between 3p.m. – 8p.m. and Saturday, December 17 between 11a.m. – 6p.m. at the Grossinger City Autoplex (1530 N Dayton Street). Many of the vendors this year have returned from last year’s inaugural Bazaar and include choices for local honey, coffee, baked goods, chocolates, sauces and more! On my shopping list is an assortment of sweets from Rich Chocolates & Candies. 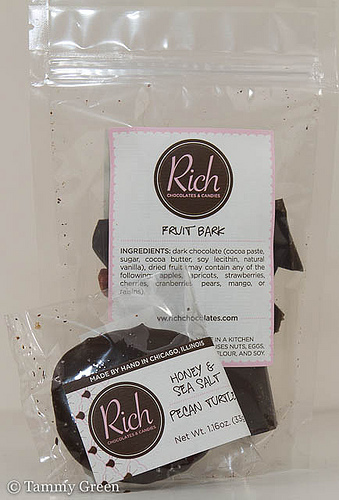 I’m a fan of Rich’s sumptuous dark chocolate bark dotted with dried cherries and apples. The Pub Bark is sprinkled with pretzels, peanuts and corn chips — it’s a sweet and salty experience that’s surprisingly addictive. I always buy a Windy City Truffle Package for the office and one pecan turtle so I make it home without sneaking bites of the rest. If you have a Chicagoan on your list, you should consider an À La Card Chicago package. This handy deck of 52 cards gives a $10 gift certificate to a chef-driven, owner-operated restaurant in Chicago. If your intended gift recipient is a bar enthusiast, then The Drink Deck is an affordable way to explore the Chicago scene. Another good choice for gifts are preserves. 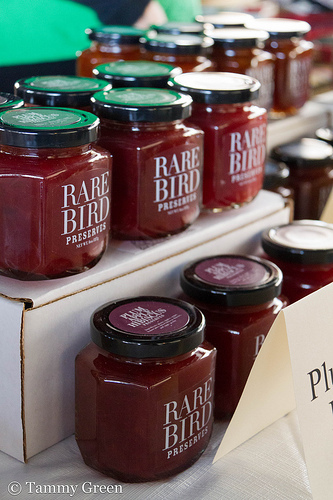 Elizabeth Madden of Rare Bird Preserves sources local fruits and herbs from farmers all summer and turns them into delicious fruit spreads. If you’re lucky, she will have samples of Fig Earl Grey or Plum Apple Hibiscus jams to try. I try to stay stocked up on these as well as the Lemon Blueberry — I like to have a fresh taste of Summer during the coldest part of the year. With that logic in mind, it’s a good idea to pick up a few jars of salsa, tomato soup with fire roasted peppers, and Bloody Mary mix from Tomato Mountain. They use all organic tomatoes and preserve their products at the peak of freshness. It’s easy to find something for the finickiest person on your list. Hope to run into you at the Bazaar! This entry was posted in Dining and tagged 2011, A La Card, Grinderman Coffee, Ms. Mint's Holiday Bazaar, Rare Bird Preserves, Rich Chocolates & Candies, The Drink Deck, Tomato Mountain. Bookmark the permalink. Tammy, thanks for your post and the mention of Drink Deck! We look forward to our 2nd year at Ms Mint! See you there. Rich Chocolates & Candies has an amazing peppermint bark! Highly suggested! Thank you for post!